The pillow tank can be used to store industrial water, fire water, rainwater harvesting, irrigation water, concrete mixing water, slope green water, sewage water storage, oil well cementing, diesel oil, aviation fuel and food oil. Its advantages are: can be folded when empty, the weight light and easy to transport, on-site installation is simple, long life and low maintenance costs. 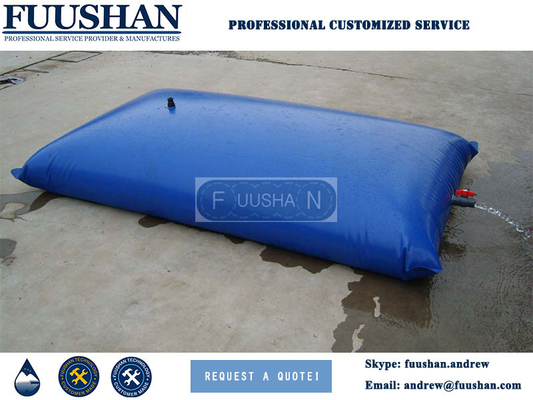 Fuushan water tank designed and manufactured by Fushan Energy Technology Co.,Ltd., are made of environmentally-friendly, nontoxic polymer material that contains in more than ten kinds of anti-aging, acid-resistant, alkaline-resistant and fire-resistant additives. They have been widely used for storing and transporting water and fuel. Besides, they are very user-friendly, and can be assembled within two minutes with connectors and pipes supplied. After use, they can be folded for future use. Mostly importantly, it is affordable and economical. 1. Our company give more priority to use feeling and quality. It is the result of long-term use. We give more priority to our quality and service so as to create our brand equity too. Because of market acceptance, we won't quote too high or too low. If you give more priority to the price, please tell us in advance. So that we can quote you suitable material with best price. If you only want to compare the price, you can ignore us. 2.Before sending us your inquiry, please check our specifications of product carefully.And tell us the model with quanity. of order.If you are dealer who just want to buy 1-5 pcs,please let us know in advance. 3.If you are the single who just want to know more information about our product,please note in your inquiry. We will provide you more details and also tell you where the market is or how the market is.